(1) All magnets have two poles: North-seeking pole and South-seeking pole. The magnetic effect is strongest at the poles. North-seeking pole (North Pole, N) is the end of the magnet that points to the northern end of the Earth. South-seeking pole (South Pole, S) is the end of the magnet that points to the southern end of the Earth. Note that when a magnet is cut into pieces, each piece itself is a small magnet with a North pole and a South pole. (2) A freely suspended magnet always comes to rest in a North-South direction. (3) Law of Magnetism: Like poles repel, unlike poles attract. Remember that for magnetism, we talk about poles while charges for electrostatics! (4) Magnets attract magnetic materials. 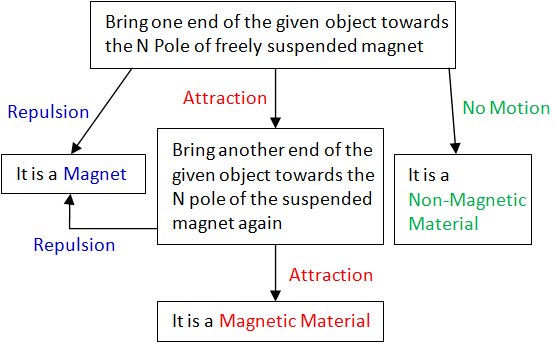 (5) Repulsion is the only test to determine if a given object is a magnet as attraction can occur between two magnets or between a magnet and a magnetic material.